So maybe I didn't win the Bacon Cook-off with my dish. It's a good thing I am a born pessimist because I didn't expect to win. But I didn't expect to come in dead last, either. It was an ego blow, but that's ok. Live and learn. And other good things have already come of the experience, so I win anyway. Thank you to the judges who came up to me afterwards to commend my sandwich, and especially to the audience member who called me over to whisper that my dish was the best. That made me feel really good. So you probably want to know what I created. Well, it's like this: because entering recipe contests has taught me that simple recipes work best, I aimed to make the most simple yet most tasty bacon dish possible. 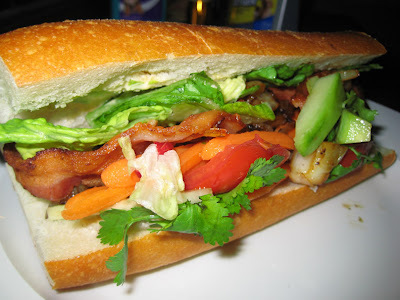 I chose a riff on the ever-popular BLT, but done as a Banh Mi. In addition to bacon, lettuce, and tomato, I made a spicy lemongrass mayo, pickled carrots and daikon, cucumber spears, and a garnish of cilantro to bring in the traditional flavors of Vietnam. Mr Minx and I made a few versions of this sandwich on different kinds of bread. 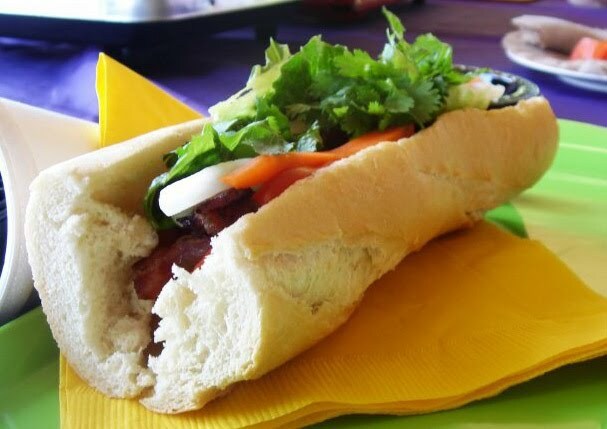 Vietnamese Banh Mi bread is traditionally a baguette made with some rice flour, which adds a certain crispness. But this is Baltimore and that kind of product is nowhere to be found. After auditioning breads from Atwater's and Panera, we found the crust on those versions were just too crunchy for this usage. In the end, we settled on a cheap French baguette from Giant. It's crisp without being too hard, and bland enough to let the rest of the ingredients sing. Combine all ingredients and allow to sit at room temperature for 15-20 minutes so the flavors can meld. Combine all ingredients and allow to sit at room temperature for half an hour. Spread baguette with mayonnaise. Top with, in this order: 2 or three tomato slices, 2 pieces each of pancetta and bacon, several strips of daikon and carrot, 2 cucumber spears, and a small handful of cilantro. Makes 4 or more sandwiches, depending on the size of your bread and the number of slices of bacon per package. Looks Yummy! Did you guys melt Saturday like we did Sunday? OMG yes! And maybe even worse because we were running around cooking for part of the time.